Two weeks ago I shared a pretty Pink Water Lily Hexagonal Gift Box that I had made. In my post I promised to share the measurements for my gift box, once I had located the scrap of paper I wrote my notes on, within my craft room that looked like a crafting bomb went off. Well my room still looks the same, but I did locate said "scrap" and have made another box to be able to share photos and details of how to make the hexagonal gift box. 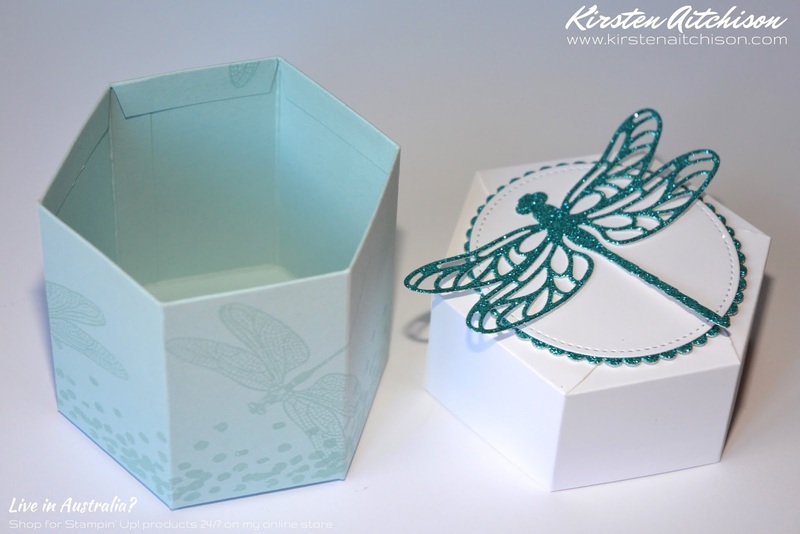 This post is to share my latest hexagonal gift box creation and a matching card I ended up creating as well. So as to not make this an epic post, I am working on an additional post with step by step details and photos showing how to make the gift box, which will be up on my blog tomorrow. 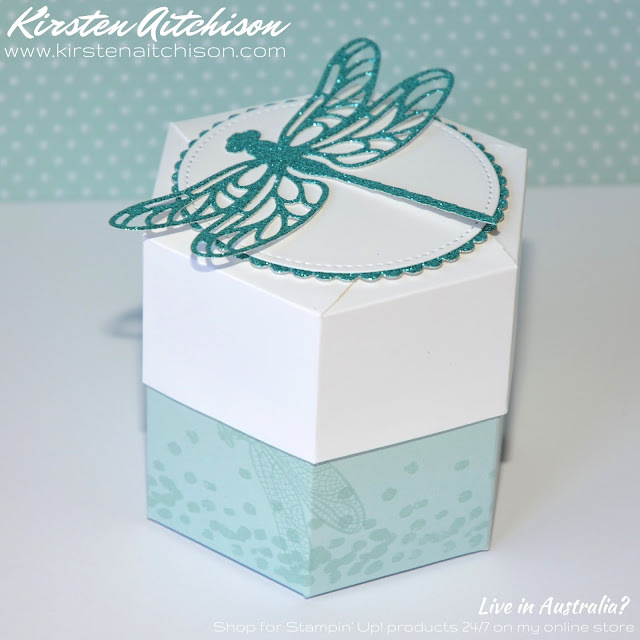 Click here to view my post with the free tutorial on how to make this gift box. 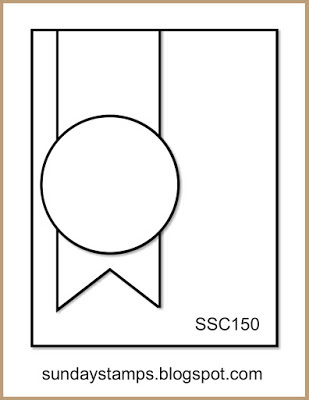 .... and the SSC150 Banner Love Take Two sketch challenge from Sunday Stamps provided the layout for my matching card. My creations also fit in with the HLS April Anything Goes with Dies challenge from Happy Little Stampers. I just love glimmer paper and in my mind it is so special that I hardly ever use it. I got some free with Sale-A-Bration and felt I could splurge and use some of this gorgeous sparkly paper. Since it is so precious in my mind, I couldn't bear to waste a bit. So.... what to do with all the little pieces left over after cutting the dragonfly for my box? Why use them to make a matching card, of course. I was originally going to decorate my box with a Soft Sky dragonfly, but after finding the GDP083 challenge I went with glimmer instead. So I decided to use the Soft Sky dragonfly I had already cut out along with the left over glimmer pieces to make my sparkly matching card. I am creating a separate tutorial on how I made my matching card, with some tips & tricks, which will be available soon to purchase through my Handmade With Love Online Store for only $3.50 AUD. 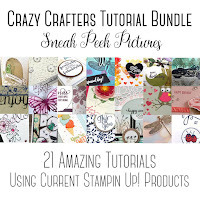 If you love my card, I would be very grateful and most appreciative for your support by purchasing my PDF tutorial, so that you can make your very own. my Handmade With Love Online Store. If you enjoy what I do, I would love you to Like and Follow my Facebook page, and Pin my projects on Pinterest (or you can follow me on Pinterest). If you like this project, it would make my day if you left me a comment. 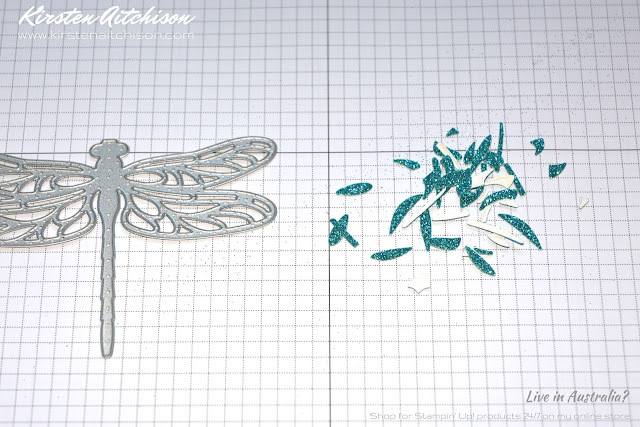 I have also included this project as my entry for this weeks Crazy Crafters Team Project Highlight. 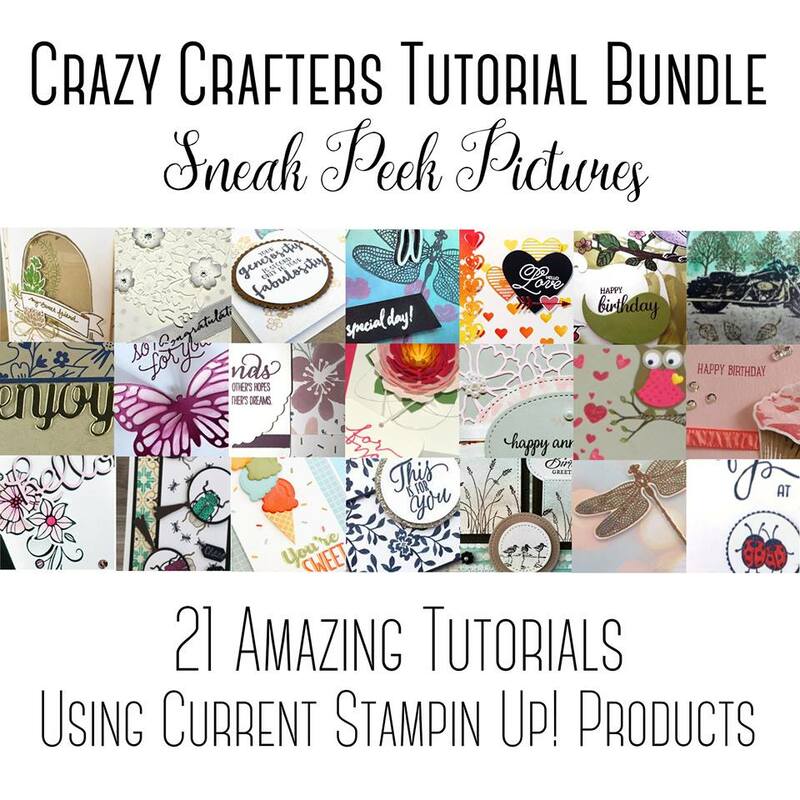 Click Here to view the projects submitted by the very creative Crazy Crafters Team, and to vote for your favourite projects (Link goes live 28th April at 7pm AEST). 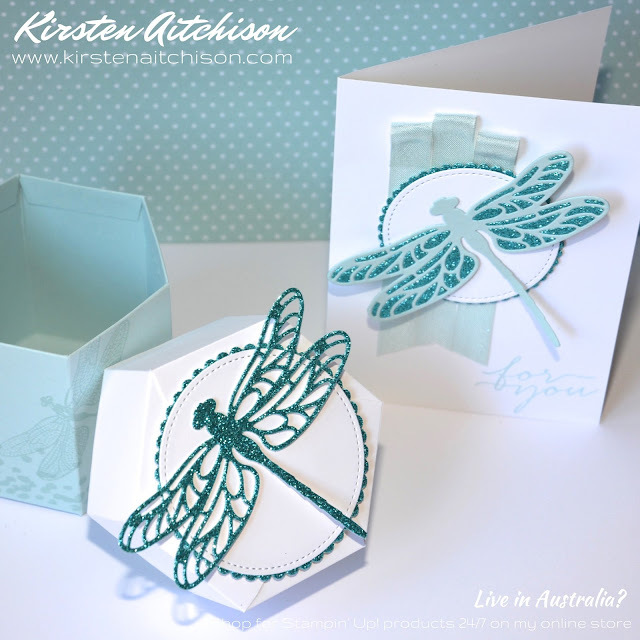 So glad you decided to use some of your stash of Glimmer Paper Kirsten! Love the card and love your gift box. 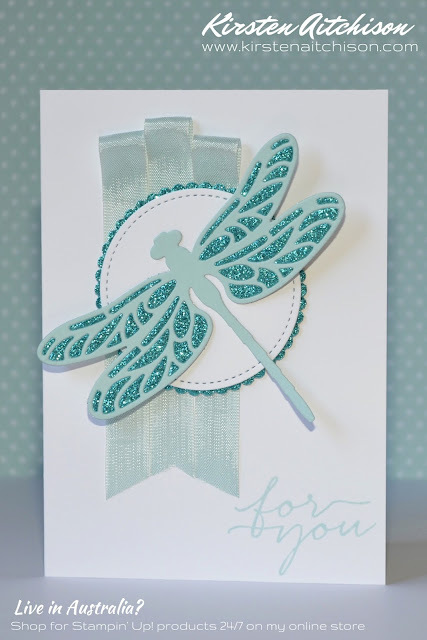 Using the left over glimmer paper pieces in the dragonfly on your card is true dedication to all things glimmer and so totally worth the effort! Gorgeous! 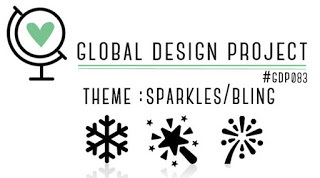 Thanks for playing along with this week's Global Design Project challenge. Thanks so much GDP Design Team :) And thank you so much for this weeks challenge. My box would have had a very different look if I hadn't added any sparkles. Simply stunning! Your dragonflies are beautiful and the colors are just perfect. Love both projects! Thanks for joining us at Sunday Stamps, hope to see you again soon! Thanks so much Amy :) And thank you to the Sunday Stamps Design Team for that wonderful sketch - I am really happy with how my card turned out. Beautiful ensemble, and I love the use of the colored glimmer paper. I'm so sad it didn't stick around longer. Thanks for joining Sunday Stamps this week. Thanks so much Heidi :) I too am sad about the coloured glimmer paper not hanging around. What a lovely box and card set. LOVE that glittery dragonfly. Thanks so much for joining us at Sunday Stamps this week. 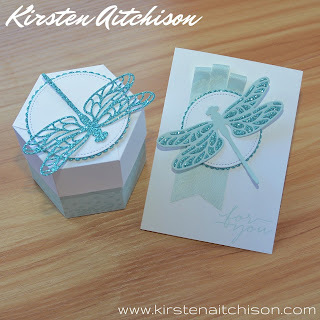 Thanks so much Leena :) I am really happy with how the glittery dragonfly turned out. It is even prettier in real life. This is just lovely! Your dragonflies are just WOW...I can't stop looking at them! Thanks so much Lisa :) Yes, they are very sparkly and very distracting sitting here in my craft room. 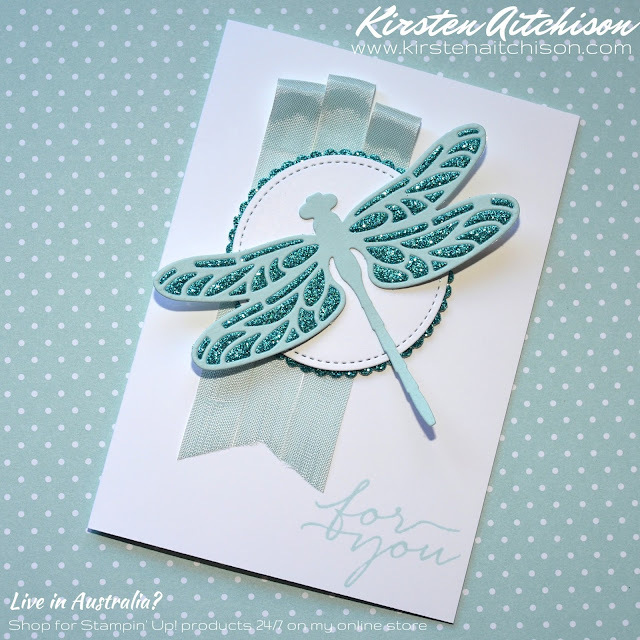 That dragonfly is gorgeous..love the glitter! 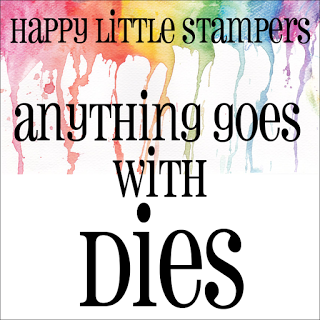 Thanks for sharing at Happy Little Stampers...so glad you joined us! 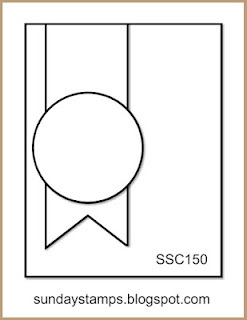 Thanks so much Laurie :) Glad I was able to join your die cut challenge. The box and card are both so pretty. I always love a monochromatic project! STUNNING!! Love everything about this Kirsten. Such an attractive and elegant gift box and matching card.